So, spring has sprung and with that said, we at Thai Bounty are excited about some new additions to our menu as well as the execution of a new food concept that’s in development stages on the Thai Bounty front. First, menu wise, we have now introduced several new appetizers to compliment our made to order meals. Our long awaited Green Papaya salad is now available. This delicious refreshing salad is made to order using old world pedestal & mortar in it’s preparation……yep, that’s right, no electrical plug here. Other new appetizers on the menu are Crispy Fried Chicken Wings served with a savory dipping sauce and side of papaya salad; Chicken Satay basted and grilled with coconut milk marinade, served with our special peanut sauce and side of cucumber salad; Crispy Fried Shrimp Wraps served with our special dipping sauce, and from the sea, we now offer another version of our delicious Larb this one made from fresh Yellowtail. We hope you enjoy these new items as much as we enjoyed creating them for your dining pleasure. Ok, now drum roll……………Thai Bounty is proud to present the El Morro, Cuban American Café that will open its doors this Saturday, April 2nd at 6:00am. Our opening of the El Morro Cafe also coincides with my personal passion it is the first weekend of the sport-fishing season. We will be offering of course great fresh ground coffee, espressos and house made baked goods as well as full breakfasts. Fisherman take note we also have bulk (cubed) ice for sale in 50lb. bags for $10. Located just a stone’s throw away from the launch ramp, and located on the Embarcadero, El Morro Café is convenient one stop for ice, coffee, breakfast or food to-go. It’s spring and we are excited where Thai Bounty is headed for in 2016. Come try our Lunch Specials!!!!! 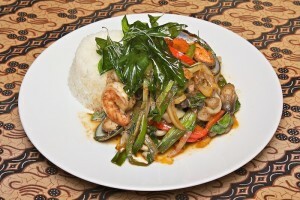 The Thai Bounty features authentic Thai BBQ, seafood, and cuisine. Locally owned and operated, we consistently use the freshest, most wholesome ingredients available.